As smartphones come to dominate much of our daily lives, mobile video has become the dominant medium. You may create for a movie theater or tv screen, but chances are good a lot of people will experience your work for the first time on a screen they can hold in their hand. Ani Acopian, a filmmaker, is part of a generation that is learning how to subvert and surprise our expectation of how a mobile video should look, and work. Acopian has been a finalist at the Tribeca Film Festival and Shorty Awards. She was selected as a Future of Storytelling fellow in 2017 and has been producing spots for global brands like Red Bull. She graduated from Wesleyan University's Film Studies program and currently splits her time between Los Angeles and New York. Recently Acopian got her first drone. Her work is meant to confuse, then delight. It uses aerial imagery to present the viewer with something they can't quite understand, then slowly reveals the subject through a playful shift in perspective. 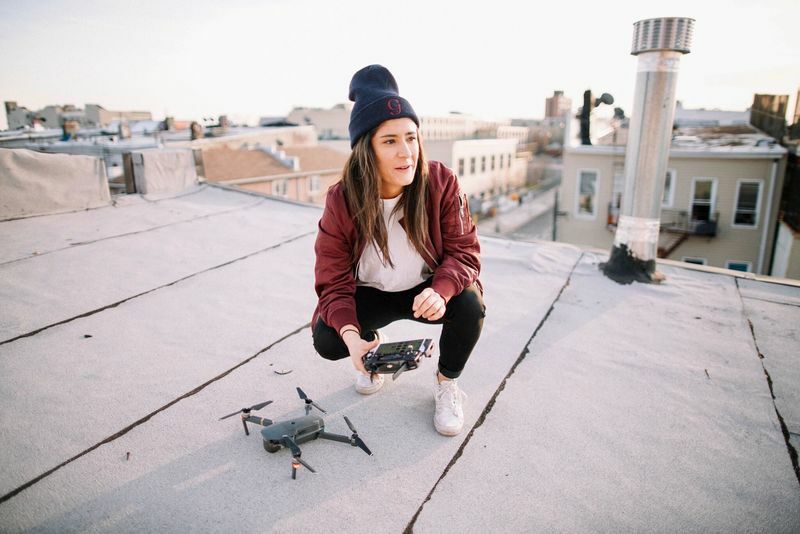 We sat down for a chat with Acopian, who shared her thoughts on why drones are becoming increasingly popular with creators on Instagram and Snapchat, and where the genre of mobile video might be headed next. You can check out more of her work here. When did you first start making films and videos? My dad took pictures of me and my sister every day. He did from the time I was born until I was 14, and then I didn’t want to do it anymore. The timelapse of those pictures is pretty cool. My dad was always filming my sister and I as we grew up, and I was usually asking to hold the camera.This was a VHS camcorder. So a lot of the footage I filmed is really shaky. In grade school, I would make my family act in funny short videos around the house. In ninth grade I made a parody music video for an English project -- it was a hit in class, and it definitely beat writing essays. From that moment on, I took every chance I got to make a video for something. What made you decide to get a drone? My friend Jeremy kept telling me that "drones are the future!" and that "you'll be able to make such cool stuff!" but I was hesitant because I had never flown one, and they're not exactly cheap. It was January 2017 and I was going on a trip to Spain, so I felt that it was the perfect time to invest in a drone. I purchased the Mavic Pro. After 2 minutes I tried to return it because I was overwhelmed by how much I didn't know, but the man who sold it to me, Alex, convinced me that I would get the hang of it and have a lot of fun with it. Alex gave me his phone number and told me that I could call him if I ever had questions, which I did... everyday. So I really have to thanks Alex for encouraging me to go through with my Mavic Pro purchase! I ended up not even flying in Spain, but upon my return I started to take test flights. I immediately got inspired by the professional look it had and the ability to see the world from a new perspective. You're great at playing with the formats of modern media -- Snapchat, Instagram, etc. What do you think catches people's eye these days? Where is the medium headed? At this point, the Instagram bubble has become very saturated with people producing content that "works" and is relatively safe and "premium" looking. I think people respond best to familiar things with new twists. I think we're going to start seeing more creators get tapped to help create familiar videos with new twists as short-form content budgets get bigger. I also think that eventually we will evolve past social media apps and to something more immersive, and potentially (a girl can dream) healthier. We saw Vero take off for a hot second because it promised to not be about likes. I have a feeling that Augmented Reality will shake things up. How does a drone play into the world of mobile video? It's important for mobile video to be eye-catching and to make sense without sound because we consume it so quickly. Drone footage checks off both of those boxes. I carry the Mavic Pro in my backpack along with my mirrorless camera, stabilizer, tripod and four lenses. People are always like, "You have a drone in there?" The portability is its best feature, because it allows you to capture whatever happens, whenever, and then send it straight to your phone. I think a lot of people are realizing that just because most people will see it on their phone, that doesn’t mean you have to shoot it on your phone. A lot of film sets are working to shoot in 1:1 or 4:5 format. It’s funny, cause the monitors and other tech on set haven’t caught up yet. What comes next? If you had the opportunity to pursue any dream project, what would it be? Up next for me is focusing on making music videos. I really love working with and directing artists, and I'm excited to take my short-form style and apply it to slightly longer videos in which sound is an integral part. My dream project is not reliant on money, but instead on the people involved. Artists I hope to work with include Nicki Minaj, OK GO, and Chromeo. What I like about sharing work on social media is you get to test techniques, you get to play, your audience is watching you learn. But at the end of the day it’s also important for me to create things that have more of lasting impact on the culture.